Looking for a fun and festive way to decorate for St. Patrick’s Day this year? 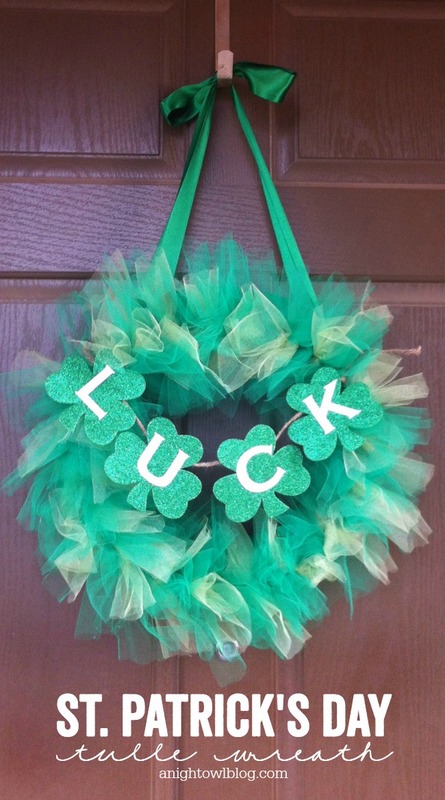 Check out how to make this easy Tulle St. Patrick’s Day Wreath! Hi friends! Today I’m sharing a perfectly FUN and fluffy Tulle St. Patrick’s Day Wreath! 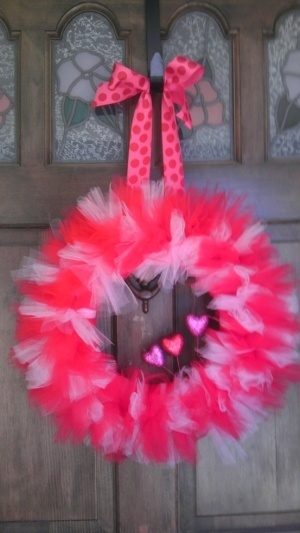 For Valentine’s day, my friend Erin made this gorgeous Valentine’s Day Wreath – out of tulle! I was so inspired by her gorgeous creation, I thought I would give it a try for St. Patrick’s Day! So I gathered up the supplies and got to work! Wrap a 12 inch straw or styrofoam wreath form using a spool of green ribbon. Cut hunter green and lime green tulle into 17 inch strips. Tie the strips of tulle around the wreath, alternating 3 hunter green strips and 1 lime green strip, all the way around the wreath until covered. 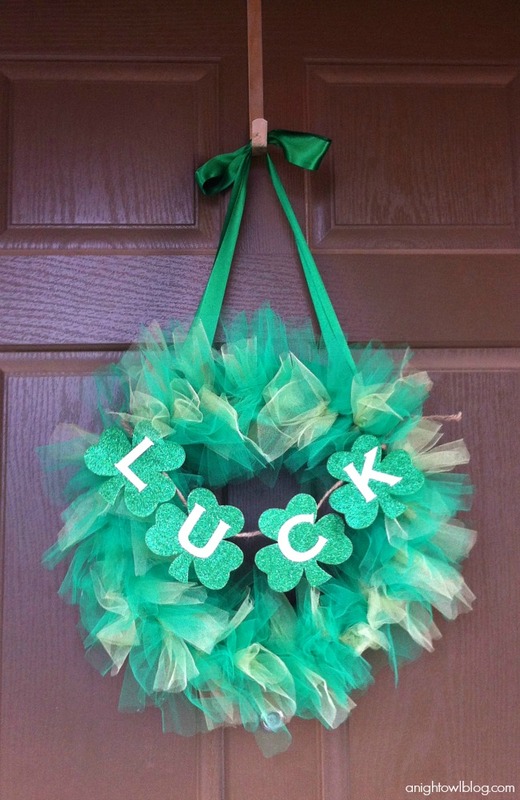 Cut the letters “LUCK” out of cardstock and glue them to shamrocks, which you could also cut out (I happened to buy a package of pre-cut glitter shamrocks from the dollar store). Glue the shamrocks to twine and tie the letters to the wreath. Glue green ribbon to the wreath and hang on the door. 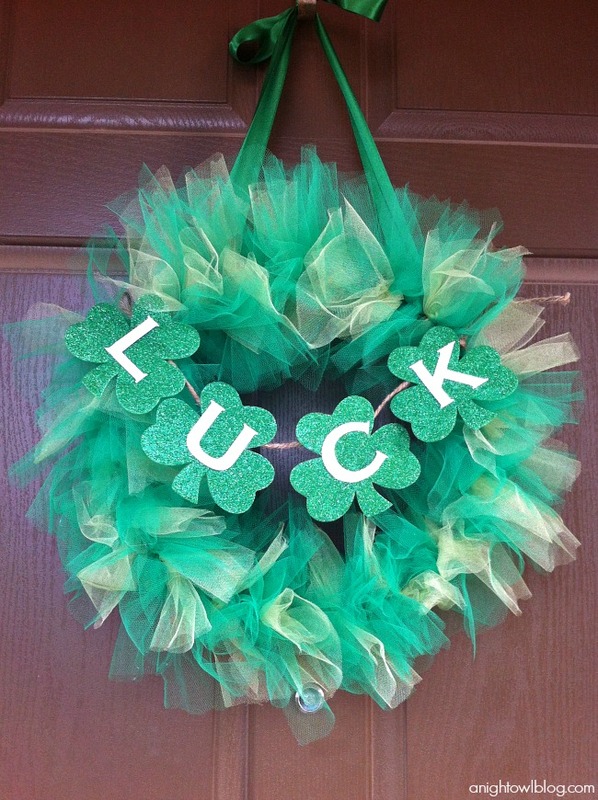 And I just LOVE how the adorable Tulle St. Patrick’s Day Wreath turned out! What do you think? I love the way that it turned out! It’s fluffy (as my husband calls it) and FUN! And definitely easier and less time consuming than yarn wreaths, which I also love, just don’t always have time for! 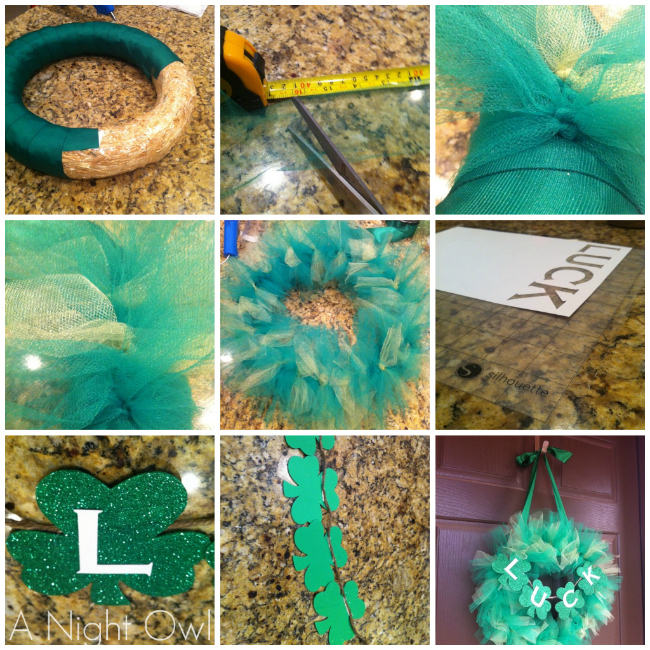 So what crafts are you tackling this St. Patrick’s Day? Oh, this is so cute! I love how fluffy it turned out, and I’m definitely digging the glittered shamrocks. I’m pinning this one for sure! This is adorable! I hope you’ll link it up to my new linky party! I’m a new follower! Hope you’ll stop by and follow along if you’d like! This is so pretty! I love the green! I would love it if you stopped by My Favorite Things Party & linked this up! The Party runs all week so I hope to see you there! Stopping by from the I Heart Nap Time Party. Kimberly! I found you through 36 Ave’s blog hop, I hope you’ll follow me back! I am LOVING your blog. Confession: I have a slight obsession with everything owl.. so we’d make great friends.. also.. I love the charlie sheen “pinning” button you have. Pretty much what I’m saying here is get your cute little booty over to my blog so we can be best friends, alright? would love you to stop over at Gomhp and Link up some of your posts! What a PERFECT wreath! Thank you SO much for sharing and for the inspiration! :o) And thank you for linking up to Crafty Scrappy Happy’s big blog party!!!! Very cute wreath! I love tulle. how cute is this project AND how cute is your BLOG???? yum! Yay you were first linking up! can’t wait to explore your blog more & fyi I’m your newest linky follower! So glad to have you! 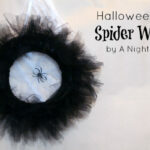 The wreath is really just too cute:) I’m stopping by from the Blog Hop and I’m your newest follower! I hope you can stop by my blog. Just Pinned your wreath – love it! This is super cute!! 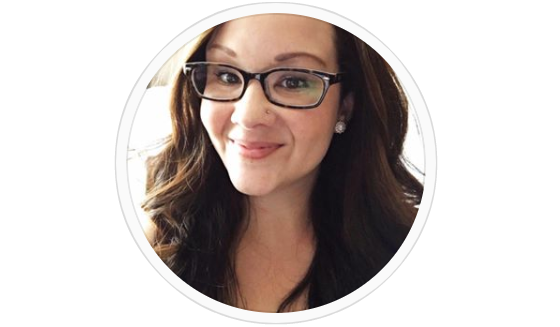 Found your blog through a blog hop! Would love to have you follow me too! Would love for you to link up some of your cute crafts on my ” Homemade By You” link party on Wednesdays! Super Cute! Come share at my party: https://www.dwellonjoy.com/2012/02/dwell-on-fridays-five.html. Psst..love your owl header and blog, so cute! Cuteness!! My husband is from Galway, Ireland making Paddy’s our favorite holiday! I’d love it if you’d join my linky party Destination: Inspiration on Teagan’s Travels with this! PS: Can’t wait to see you at the Glitter Academy! I featured your wreath on my blog tonight! : ) Stop by and grab a featured button! Found you on Vintage Wanna Bee! I love this wreath! I am a new follower and looking forward to more great posts! Your wreath is so pretty, very creative! Love this great idea for a wreath for any season and holiday! 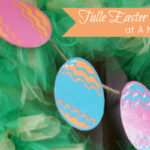 I am already thinking Easter with pink and white or yellow…..
You are one Tulle wreath makin’ Machine! LOVE it! Can you approximate how much tulle was needed to go around the 12″ straw frame? I realize you cut strips around 17″ long, but that does not tell yardage requirement. Thank you. Hi Julie! It’s been a while but I think I used a whole spool of the dark green and about half of the light green. Hope that helps! Hi Marion – I purchased spools of tulle that are about 6 inches wide; so 6in by 17in strips. Hope that helps! thank you, I bought it by the yard (on sale) wont be a problem cutting them I also found some white tulle with little shamrocks on them. Hi Kathryn! I believe I ended up using about a standard roll and a half of the kelly green tulle and less than a standard roll of the lime green. Hope that helps! I stumbled on this while looking for something to make with my grandchildren. I think it is so festive and pretty. I am not very creative and actually all thumbs but I try. I purchased the tulle and cut the strips but 17″ seems too long. Do I need to wrap the tulle a couple of times around the wreath or trim it all when finished? I think my twins will like this for Easter as well as St. Pat’s Day, Thanks for sharing. Hi Saranne! I definitely did 17″ as you can see in the picture, and only wrapped around once, tying a knot around the wreath form. I was going for a VERY fluffy look; however if you feel that it’s too long, feel free to knock a couple of inches off that! Or trimming afterwards would be just fine! I’m sure it will still turn out adorable! Very cool wreath! Gonna pin this one for sure. Thanks for sharing with us. Been wanting to try the tulle wreaths. You just inspired me to take the first step into the tulle world, so to speak. Love this! I saw it too late for St. Patrick’s Day, so I’m making one for Easter. I picked up bright pink, bright yellow, bright purple, and bright green tulle today. I’m going for a dyed Easter egg look. My mom gave the kids a cute bunny decoration that I’m going to hang in the middle. I can’t wait to see how it turns out! Thank you for sharing your idea! How fun, Jennifer! You’ll have to be sure to share a picture with me when you’re done! Hi Rebecca – I did use 17 inch strips, I went through about 1 and a half standard spools of the dark green and half a spool of the light green. Hope that helps!